Perfect for nervous/excited kids about to go to kindergarten (and their parents!). This engaging adaptation of “The Twelve Days of Christmas” convinces parents and children alike that there is no place cooler than a kindergarten classroom. On the first day of kindergarten, there’s so much to do! From making new friends to jumping rope in gym to riding the bus to school, there are lots of exciting firsts to look forward to. Even though saying good-bye to Mom and Dad is hard, when the school bus pulls up, it’s time to begin kindergarten fun. Tish Rabe is a seasoned children’s book author with over 160 titles, including ones for Sesame Street and Curious George, under her belt. 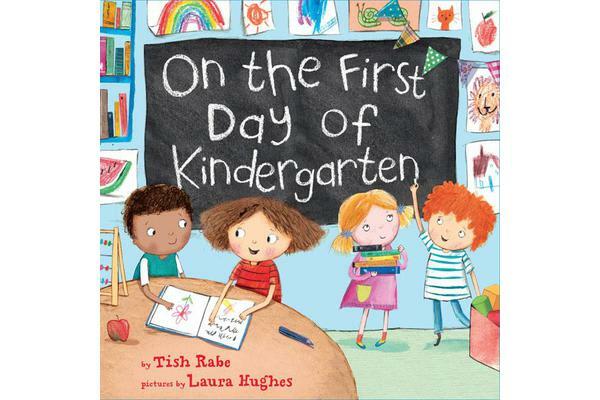 Like Natasha Wing with The Night Before Christmas, Rabe puts a novel spin on a first-day-of-school classic with On the First Day of Kindergarten. And don’t miss the follow-up: On the First Day of First Grade!